Brick.ie is the Irish community for AFOLs, Adult Fans of Lego. Our aim is to bring together Lego fans in Ireland or with a connection to Ireland to form a strong community, both online and offline. At present there is no membership charge - to join register an account, then post to our forum stating you'd like to be a member. Until you do you will only have limited access to the site. Our forum will host lively discussion about all aspects of the brick, while we will hold regular gatherings of Lego fans to establish face-to-face contact. Please use the contact form if you would like to get in touch with us. Perhaps best of all we are excited to be bringing the world record breaking FairyBricks LEGO mosaic team over to Ireland also for the first time to allow our visitors sample that fantastic building experience. As 2018 comes to a close, we can reflect on our busiest year ever with a very successful first event in Blessington Library before Christmas which we hope will become a regular event in our calendar. We were also delighted with the turnout for our annual member's family day held in Naas, a week later. It was great to see so many of our members and their families enjoying themselves at our largest meetup of the year with lots of competitions, building and chat. There will be no time for LEGO cobwebs. 2019 starts as a hectic 2018 ends with an exhibition already lined up for Saturday 26 January at Birr Library, our first display of the new year. Why not check out what our members have been up to over the Christmas break? Wishing all our members and visitors every good wish for 2019. Looking for somewhere to bring the little ones to round off the summer holidays? This coming weekend (25th and 26th August) a team of brick.ie builders heads down to the Radisson Blu Hotel in Cork to create the Fanzone at Brickxfest Cork. This dedicated area for fan-built creations will accompany the brick pits and building challenges provided by the Brickx Club. Check out the Brickx Club Facebook page for ticket information. We barely have time to pack our models away before we return to Munster. On Sunday 9th September a brick.ie team returns to the South Court Hotel in Limerick as part of the popular Limerick Diecast Show. It doesn't stop there as we've a busy few weeks and months ahead. 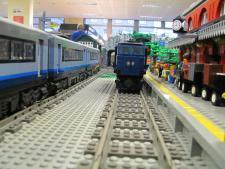 If you can't make it to Cork or Limerick brick.ie models will be at the Model Railway Society of Ireland's model railway show in Dublin over the October bank holiday weekend.